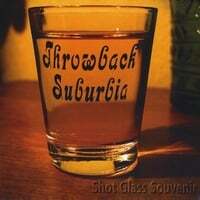 Throwback Suburbia-Shot Glass Souvenir. I often take an expansive view of "power pop" in the choice of releases reviewed on here, but you don't have to stretch the definition of "power pop" very far to include Portland's Throwback Suburbia. These guys have the quintessential power pop sound: crunchy guitars, sweet melodies, hooks galore and songs about girls. Their third full-length builds on the strengths of their previous releases and finds them on top of their game. "Give and Take" fits the template described above with "bah-bah" vocals in the bridge and nice use of piano to back the usual power trio, "Setting Sun" follows the bouncy staccato beat template that goes back to The Beatles' "Getting Better" to fine effect, and "It's You" has a breezy-enough melody that would have found massive radio airplay if the calendar found us wearing bell bottoms and complaining about Richard Nixon. And if smoking weren't considered passe, we'd all be holding up our lighters during the classic power ballad "Here Again". So yes, the "throwback" in their name fits to a T, and we wouldn't have it any other way, would we? Jay Gonzalez-Mess of Happiness. One of my old-time online power pop buddies (Daniel from Spain) brought this one to my attention, and given the artist's name and his neo-classic power pop sound my first impression was that Gonzalez is the latest in a long line of Spanish power pop revivalists like Damien Lott. But no, Jay's as American as apple pie, hailing from Athens, GA, and he just happens to be the current keyboardist for alt-country icons Drive-By Truckers. But alt-country this is not - Gonzalez has crafted a highly melodic album in the vein of Brendan Benson and Jason Falkner and frankly I'm enjoying it more than the most recent releases from those two. "Punch of Love" is an aptly-named punchy opener, and the absolutely gorgeous and melodically spry "Luisa" is hands-down my favorite track on the album. Elsewhere, the joyous "Turning Me On" is almost like a Gilbert O'Sullivan track brought into the 21st century, "Baby Tusk" wears its 70s influences on its sleeve with a melody ripped from the era, and Gonzalez lets his keyboard prowess come to the fore with the quirky pop of "Sticky Little Fingers". There's nothing like an unexpectedly great album to come from an unexpected source to make one's day, and this one will be hard-pressed to be dislodged from my year-end top 10. I'm so glad I found this blog. These are great discoveries and I'll be subscribing from now on.